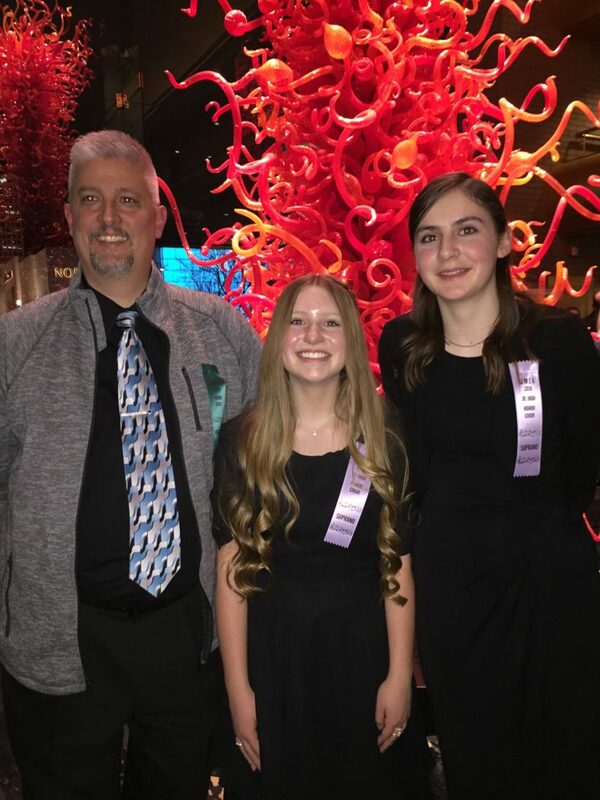 Two Gunnison eighth-grade students, Noelle Condie (middle) and Piper Jensen (right), participated in the Utah Junior High Honor Choir in Salt Lake City last weekend. Joseph Allred (left) is the choir director at Gunnison Valley High School. SALT LAKE CITY—Five Gunnison students participated in Utah Honor Choirs last weekend. 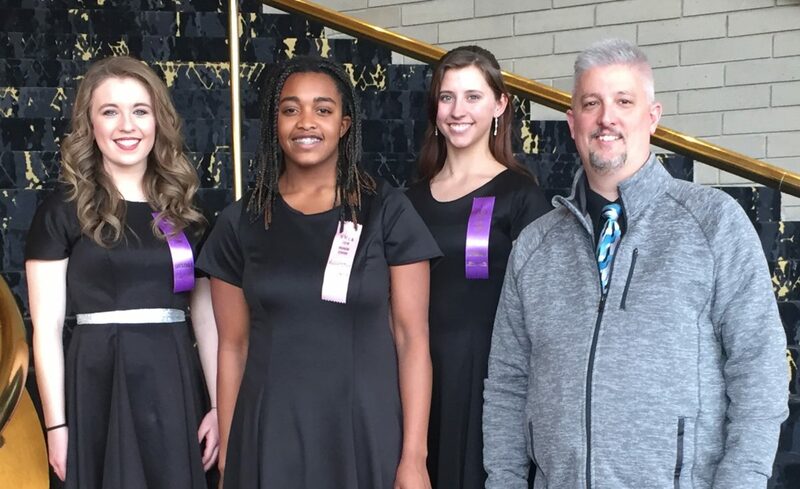 Gunnison Valley High School was represented by Carolyn Donaldson (12th grade), Mia Condie (10th grade), and Sadie Cox (ninth grade) at the Utah High School Women’s Honor Choir, which sang in Abravanel Hall in Salt Lake City on Saturday, Jan. 27, at 1 p.m. The Utah High School Men’s Honor Choir also performed at the same concert. The women were directed by Leslie Walker of Springville High School, and the men by Kenny Wiser of Provo High School. In all, around 600 students from around the state participated. Each group sang five numbers, then combined for two, in which the men filled the stage, with the women surrounding the audience from the first balcony. The high school singers sang for a total of seven hours on Friday at Murray High School and almost four hours on Saturday in the concert hall. Noelle Condie and Piper Jensen, both eighth-grade students from Gunnison, participated in the Utah Junior High Honor Choir. 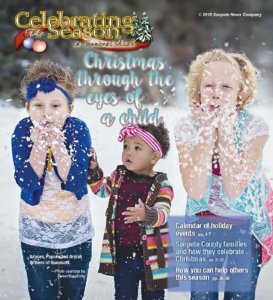 This choir consisted of close to 450 students from junior high schools and middle schools in Utah and was directed by Michael Huff, director of choral music and head of the piano area at Snow College. This group was preceded by three junior high choirs from around the state and then sang six numbers at the concert, which was held in Abravanel Hall in the evening following the high school concert. The junior high students sang for more than six hours on Friday, Jan. 26, at Lakeridge Junior High in Orem, followed by almost three hours on Saturday at Abravanel Hall. Gunnison Valley High School students Carolyn Donaldson (L-R), Sadie Cox and Mia Condie participated in the Utah High School Women’s Honor Choir last weekend. Joseph Allred (right) is their choir director at the high school.